The Knitting Pirate » In Which the Pirate Has Irish Yarn. « In Which the Pirate Completes Sock Number One. In Which the Pirate Has Irish Yarn. Friend Adina recently went on a two-week trip to Ireland with school, and brought back a present for Pirate-Husband and me - YARN. (Does she know me, or what?) I've been tasked to knit Pirate-Husband a sweater. He wants something traditional and cabled, of course, and is actually *happy* that the wool is so scratchy. It is, he says, how a sweater should be. I personally prefer softer wool, but I'm not the one wearing it, so it's all good - he'll probably wear a turtleneck underneath, anyway. 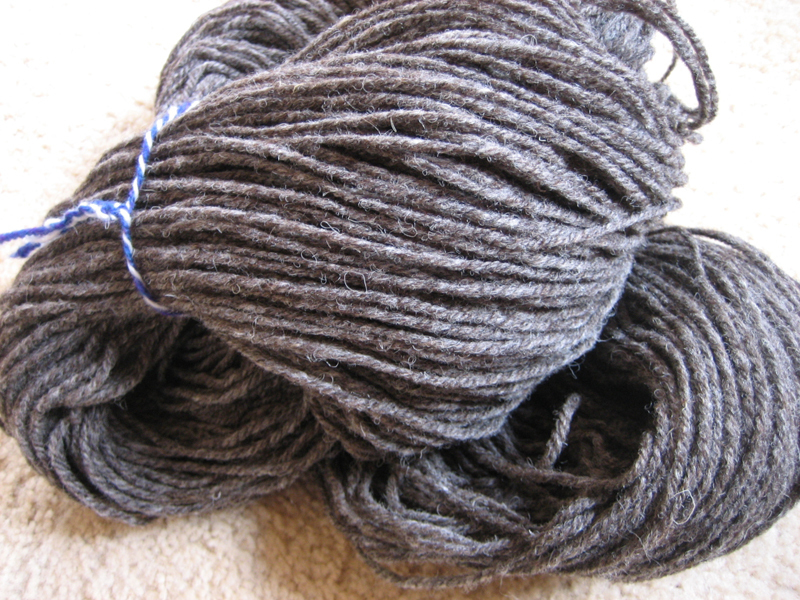 It's natural, undyed brownish-gray, a beautiful color, but the stuff is completely unlabeled. I don't know its weight or yardage. Adina said that two yarn store ladies told her that five skeins would be enough for "an extra-large American male's sweater," and she may be able to find out more, even if it involves a phone call to Ireland. At first, Pirate-Husband thought that I would be able to get this sweater knitted for him in time for next winter. I pointed out that sweaters take time, and that I don't have a pattern yet, and that I've never made an adult-size sweater before, and that I have other knitting projects going on, and that my knitting time is quite limited because it's much more important to work on the house right now. So we're planning this one for winter 2009-2010. Speaking of the house, I spent all weekend working up there. Not a single room is 100% complete yet, but we accomplished a lot - there is spackle on walls, we purchased paint, the only thing left to clean in the kitchen is the oven. On Saturday the hot tub guy told us that the spa itself is fine but the chemicals are all out of whack. We now have a testing kit and a weekly maintenance ritual. Also on Saturday I discovered that there are three koi in the supposedly empty upper pond. On Sunday it dropped way below freezing and I got to see the fish huddling around the pond heater. The lower pond has no heater; the koi freeze and thaw with the weather. We've only lost one of about twenty so far. I'm hoping the rest of them make it through the winter. 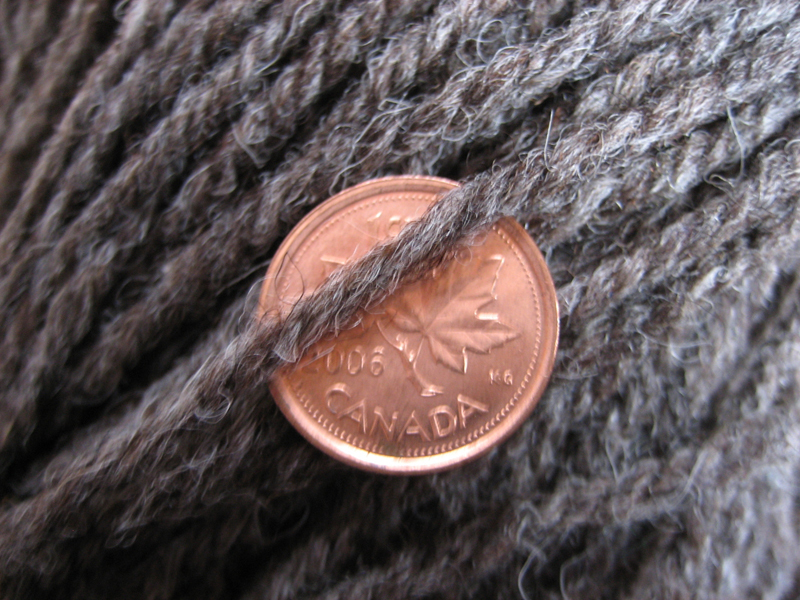 This entry was posted on Monday, February 11th, 2008 at 18:00 and is filed under irish sweater, sweater. You can follow any responses to this entry through the RSS 2.0 feed. Both comments and pings are currently closed. I am looking for a true Irish yarn to make an Aran sweater. I am interested in a green color. Can you help?